Rosacea is a common skin condition that appears as red, swollen bumps and visible blood vessels on the cheeks, nose, skin, and forehead. Early symptoms include flushing easily, swelling on the nose, cheeks and acne like breakouts that come and go. Rosacea does progress as you get older, redness tends to become deeper in color and if present spider veins are more visible. Skin can thicken with this condition, especially on the nose often a subtype of rosacea called rhinophyma. Rosacea can have triggers such as spicy foods, alcohol, particularly red wine, heat, hormones to name a few. Who Is Likely To Get Rosacea and Why? Other considerations for improving rosacea is skincare. Flair up produce irritated, sensitive dry skin. Proper skincare can help your skin to feel more comfortable and be a positive adjunct to medications. Because rosacea suffers tend to have dryness, a good moisturizer for sensitive that provides barrier protections can be helpful. Sun protection is also very important. The sun can exacerbate rosacea so applying sunscreen year round is important. We can help with skincare recommendations creating a well rounded treatment plan. To learn more about rosacea you can also visit the AAD website. 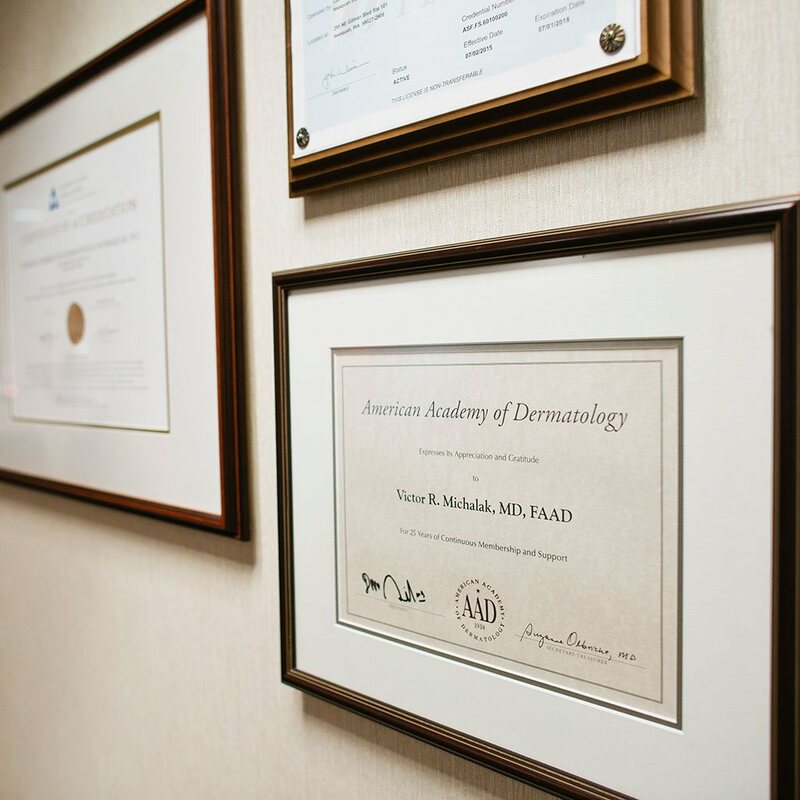 Dr. Michalak is a board certified dermatologist and has been member for years. In some cases, antibiotics such as tetracycline, minocycline or erythromycin, or cleaners or creams are prescribed. Your dermatologist will most likely recommend that you apply sunscreen daily and avoid trigger foods that aggravate the condition. If you are experiencing symptoms of rosacea, or if you would like to know more about VBeam treatment, please contact us at Dr. Michalak’s office in Issaquah. Patients can also schedule with Emily Nardiello, PA-C, Elizabeth Wood, PA-C and Debbie Gauthier, NP. Issaquah, Issaquah Highlands, Sammamish,Bellevue, Kirkland, Seattle, Renton, Maple Valley, Cle Elum, Ellensburg and surrounding areas.